My nephew was a huge Thomas the Tank Engine fan when he was little. I remember him saying it like this - "Thomas the Tank-gen" - for a while. 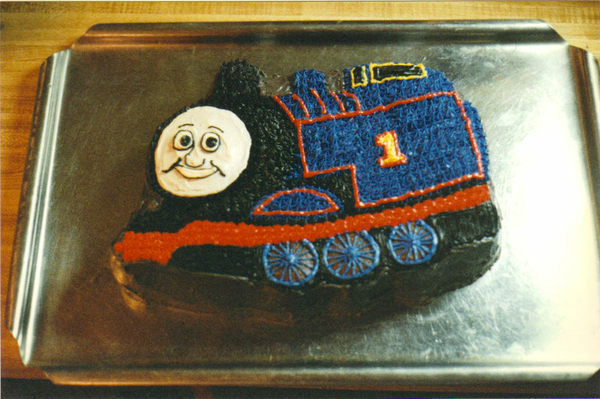 He knew all the names of the engines, and had a bunch of the books...and for his birthday, he wanted a Thomas cake. Now, even back then, I had become a bit of a creative snob and didn't want to use a character cake pan, but my I guess I realized Wilton had done a better job of creating the pan than I might do freehand, so when my sister handed it to me, I used it. I had taken painting lessons and art classes since I was nine or ten, I think. But all the painting I had done was in acrylic. So this class in oils was a huge culture shock. Acrylics dry fast, oils don't. Acrylics are thin, oils are thick. Acrylics liked me, oils most certainly did not. One of the assignments in that class was to find a picture of either an old person (lots of wrinkles) or an "ethnic" person. I swear, that's how I remember it being phrased. So in some magazine with pictures of the old west (I think), I found a portrait of a Native American gentleman. His skin was aged by the sun, and he wore these fur wraps around his two braids. He had a somber and interesting face, so that's what I chose. He seemed "ethnic" enough for the assignment. I had no problems with him, for the most part. Until I had to do the eyes. Now, in my acrylic experience, I actually did a pretty fair job with eyes. I have (somewhere) a head shot of a leopard or jaguar, and the eyes look really good. Or they did when I was eleven. Glassy and real. So it came as quite a horrible surprise to me to discover that I wasn't so good at it with the oils. With acrylic paint, if I screwed up, I could just paint over it. With oils, more paint meant more layers, and oil layers are thick layers. Now that I think about it, I also hadn't done a lot of human eyes, either, and that could have contributed to the problem. But mostly I blame the oils. My somber and dignified Native American gentleman had Marty Feldman eyes when I finally gave up and flung my brushes at the wall. Really. Three-dimensional eyeballs bulging from this otherwise not awful - and flat - portrait. And so, when I was doing Thomas, I did fine with all the little train details - I just copied the picture that came with the pan. Got his little bulbous nose and his innocent smile okay. I just could not get them to look, well, Thomasy. I hated the eyes. Hated them. Insipid, popping, Thomas eyes. I finally had to give up and put the icing down. My sister was probably pulling it away from me while I was still trying to make the eyes look correct. I cursed my lack of skill. I cursed Thomas. And I cursed oil paint, too, just because. "That's the best Thomas I ever saw!" Did I tell you he's my very favorite human on the planet? Stop looking at me, Thomas. Just stop it.